I simply cannot believe that it is November! It seems just yesterday that I was taking rest breaks on the sun porch, sipping iced tea and throwing Kilchis his Frisbee! Kilchis has a Frisbee made out of Kevlar. Bullet proof! However, it is not "lost" proof! They are floppy, and difficult to throw when wet, but as long as I can keep locating them, they are lasting forever! You can buy them at the local Tillamook Feed store. Best thing I've found for Kilchis, yet! I'm finding it difficult to find anyone who feels any sympathy for me, lately. I start a conversation, "I'm getting so sick of fishing for chinook in the back yard with no luck..." and people mock me, "Oh, Jennie... that's REALLY too bad! I feel so sorry for you that you have a river out back!" It humbles me. I am lucky! I am so lucky! I just can't catch anything out back! I can catch other places, but not at home! The good holes have changed this year, and I haven't learned to fish them, yet, obviously! This is not stopping me, though! I still try! It's wonderful therapy, and good exercise for me to walk out to the river. The wind is howling. A 35 mph gust startled me awake at 4:30 AM. It sounded all to heck like one of those aluminum lawn chairs was being thrown across the lawn. We don't have any of those, though. Wonder what it was? Oh no! A thought just came to me. What about the trampoline? It's anchored to a tree. It's too dark to see, but... but... I hesitate to look! We have lost two trampolines to the wind. One flew in the river, and one just broke apart into pieces. I guess I'll find out at first light. The boys seldom use the trampoline, anymore. They've outgrown the bouncies... It's on to bigger, and better things. Today I have physical therapy at 8:30, and then I have to call a neurosurgeon to make a first appointment, for my neck. Tis a day to stay home, do a couple contests on the board, maybe... and drink hot chocolate. The wind is howling, the rain is falling hard. The river will rise, and a fresh batch of chinook will be chasing upriver. Renewed hope for "'me bobber and me!" Well, it's taken me 44 years to grow to dislike politics, and I have ifish to blame. I had always been mostly complacent. I wasn't interested in learning about Government in school, but somehow, just like I aced my piano lessons without practicing, (don't tell!) I managed a good grade in those classes. But, a lack of interest did not determine any kind of like or dislike for politics for all of those years. They simply happened around me, and I didn't take much notice. It's funny, because I once had a terrible crush on a guy at Portland State. He was majoring in political science, so... what did I do? I took a darn class in poli/sci! My heart, of course, did not belong in the classroom. I was romancing for common interest. Running ifish has brought me many things. Many of them are wonderful things. A bunch of friends, and the satisfaction of doing good things for our rivers and streams. Finally, I love something so much that I'm willing to reach out and touch the politics behind it. So, ifish has brought me the need to get involved, politically, to save our rivers, our streams, our spawning salmon. We allow fish politics on ifish, but we do not allow partisan politics. Now, that is a very thin line to walk! Trying to balance that monster while moderating the boards is a very delicate procedure! That alone brings a bit of contention to the boards, and many questions of what is appropriate. Six months ago or so, the moderators and admins at ifish decided we weren't going to have ifish.net involved in the political scene for this year's election. We had a "just say no" policy. We came to that conclusion after seeing many people who otherwise had fishing in common, divided in the most angry and unattractive ways. Name calling, anger, opposition, nasty notes in the background... oh! The uglies were coming to ifish! We just said "no more." What an education this was for me! I had no idea the passions people felt, politically. I had no idea that democrats and republicans treated one another with such disrespect and childish hatred. I listened to right wing talk radio. I listened to Michael Moore. Both sides! I was totally floored by the lack of reason for their hatred, and instead, the outright name calling, and childish labels put on their political opposition! "Just call 'em stupid." End of story! Huh? Michael Moore, in my opinion, totally spun the right wing into a spin of oblivious nonsense. You know, I was on the debate team in high school. I saw all the tricks. There are ways to win that just aren't fair. I know. I used them! It was just a game, then, anyhow! It all the heck reminded me of once when I was winning a debate on the river. I was angry at fishermen for harassing salmon, holed up on the Kilchis when the river was low. It was like fishing in an aquarium. There was no sport there. Just total harassment, in my opinion. One fellow questioned me as to my reasons, and I kept spitting out rapid fire, reasonable answers, appropriate to his curiosity. He couldn't find his footing, and finally yelled at me, "Well, well... (as his hair stood on end in anger) YOU ARE UGLY!" I nearly dropped to my feet laughing! That frustrated comment satisfied me that I had made my point. With that, I walked back to my car, knowing that he had a few things to think about. When I saw Bill, next, he couldn't believe I had taken on a group of snaggers, alone, as a female. I guess it was then, that I realized my love for salmon is strong enough to get involved... (dare I call it) politically. Now, when I hear that type of name calling on the radio, or on speeches, or commercials, or God forbid, Ifish, I realize that the person calling names has run out of reason. Anyone who needs to lower themselves to name calling, obviously has given up all rebuttals to a debate, no matter what side they are on. The point of this writing, I suppose, is that sometimes I look at ifish, and all that it has brought me. I really would have preferred to stay in my "happy little place" where I didn't have enough passion to become involved. It was an ignorant place, yes. But it was charming, and happy, and innocent. I have been saddened to become educated on the division that exists in people. I am saddened that they love to tell jokes, at the opposition's expense. That they consider lowering themselves to dividing our members, rather than working hard to unite us in what brought us together. I suppose the same process that exists on ifish, exists in the entire US of A. It terribly saddens me that America is not one united force. At the same time, I have to respect and admire the fact that people are passionate enough to care so much. But, to care so much about something, that you divide sides against one another seems to me to be self defeating, in the end. There is a point at which your passion bites you in the backside. I know it may seem impossible. I know it may seem ignorant, and innocent, and childish... But patriotism and working towards a change for me is still going to involve bringing people together. As I watch the two divided sides this morning, in the final election, I can only hope that somehow, somewhere, someone... whoever the winners may be, that someone out there will be "romancing" for our common interest. That's a huge task for the mighty US of A! But, for me... my interests are mainly confined to "romancing the salmon." I think that will keep me and ifish as a whole, out of a lot of trouble! I kick the rocks off of the felt on my boot soles. It's freezing outside, and as I walk through the gravel driveway, I grow taller because of the rocks that stick to my boots. Glittering ice sparkles on the lawn in strips, where the trees let the light peek through. It's almost the season where we get no sun all day long, here in the canyon. Fresh elk tracks melt perfectly shaped and violent ruts into the ground. It appears they've been dancing on the river bank in the moonlight. I woke up this morning and took a deep rush of breath in the cold air, as I let the dogs out. Two brightly shining stars twinkled back at me in the pre dawn darkness. I stood still for a moment to capture the season. The fresh coffee tasted wonderful as I sipped to wait for the light to come. Right before it happens, I wander to the mud room and pull on my gear. I trudge, every morning, down to the same old hole and cast. I've quit fishing. I've taken up casting. Nothing to do with "fish" happens, lately. I don't spot them. I don't see them roll. And I don't certainly gain contact with one of them. I do believe that the higher waters of late Summer and early Fall have really changed the run this year. It's a year with good escapement for the fish. That's great and that's grand, and I'm very happy for them. But, gee... Can't one fish... just one lonely, late, lost soul take a nibble on my hook? Bill is busy with the Rendezvous tournament. He calls in a cheery voice, and reports that the ghost hole is really good this morning! "Just put number two in the boat!" I swallow, try to sound cheery and congratulatory. "That's great, Bill! Congrats!" I hang up and try to convince myself there really are fish in the Kilchis. It must be the way I'm fishing. Which rig should I try, next? Maybe if I changed bobbers, or fished with a pink jig instead of purple? Perhaps get out my planer, set down my chair, bring a cup of coffee and wait with a pink lure out there? Or maybe it's time for my fly rod, and some chums? Yesterday Bill took a second run down the Kilchis with his clients for the tournament. He spotted three chums. Count them! Three! It's November! There should be a mass of chums! No way am I going to double haul a salmon fly rod and put more stress on my shoulder for three chum in the river! My chances would be too poor for that risk. Two fish in the ghost hole, huh, Bill? It's only 8:30 AM! I have to tame this evil salmon self pity in me! It's not pretty on me, and I'm ashamed. Bill is fishing. His activity results in fish. I am casting so my activity results in a cast. I take great pride in my casts. They are long, graceful, and land right in the right spot. I'm good at casting. I can stay out of the trees, and keep doing it, even when my hands are frozen and stuck to the cork. Someday, with patience, I will quit casting, and start fishing again. But that will be up to me to decide when... right? I'll enjoy the glitter in the lawn, the fresh elk tracks, and the river, which has dropped amazingly fast. I'll thank God for the trees that tower high over my head and move, ever so slightly in the east wind. I'll appreciate the warmth of sun after the ice melts, and watch in enjoyment, as the world thaws around me. I'm going to disconnect my phone, for the day. After all, who needs fishing reports when you are just casting? It's distracting to me, all that 'fishing for fish' talk. What nonsense. I'm casting for pure enjoyment. Casting yesterday was fine, thank you, and yes, I did well! I was very successful in my casting! Not one fish bothered my casting, or my retrieving! Now, that is a good day casting! The 20th annual Rendezvous awards dinner last night was fun! Wow! They came in with a record amount of fish this year! It was really funny. The night before they had made fun of Lee Darby, for getting stuck in Tillamook Bay on a sand bar. Of course, the saying goes that there are two kinds of guides on Tillamook Bay. Those that have been stuck on a sand bar, and those that will be stuck on a sandbar. Well, yesterday Tim Juarez was traveling at the entrance to the Wilson from Memaloose and guess what? He came to the dinner party with an empty trailer! His boat was still there! Ach! But the guides at the Rendezvous don't give up easily. Lee Darby marched his clients upriver to catch fish. Tim Juarez borrowed another guide's boat, and off they went to limit out, leaving their boat high and dry at the entrance to the Wilson! Way to go, crew! Bill came in with three fish for the day. In the two day event, 76 participating anglers caught 172 salmon. 15 of these anglers caught their limits both days. Eight of the guides got their anglers limits both days. Strangely enough, the largest fish registered was only 32 1/2 pounds! The tournament raised over 50 thousand dollars for the Tillamook Steelhead Broodstock programs! Whoo hooo! Jim Erickson and Tim Juarez had their usual ten dollar bet, and Jim went home, winning by four inches with a signed ten dollar bill from Tim. Jim, in all of his pride, offered a trip down the North Fork for both Tim and Shana as a show of his thoughtfulness. Dinners both nights were wonderful and were prepared by a volunteer crew, headed up by Herb Good. The Tillamook Anglers volunteered their time to clean and vac pack all the fish taken, on both days. That's a lot of fish to handle! Three cheers for the Tillamook Anglers! Both Tim and Shana were paramount in putting together this year's event and they both pulled it off, seamlessly. Today is Steve Koler's funeral service, and I'm not quite sure if I'll be attending or not. Bill is going for certain. We may head out soon to try our luck on T bay before he (or we) go to Portland. I tend to think that Steve would have insisted we do that in his honor. For those of you who have called about shuttles in the last few days, things have been nuts with the tourney. We will now return to our regularly scheduled shuttle service. Oh brother! My kids asked last week if they could take a "personal day" off of school. What for? To go get a video game, "Halo" that would be released last night at midnight. Of course, my immediate reaction was, "Not a chance! No way!" Their plan was to go to Portland after drama practice at night, pick up the game which was on reserve, at midnight. Then, they would go to their friend's sisters home in Portland, spend the night, get up, and come home, today. Again, my answer was a firm, "No!" Well, they went. Why? What changed my mind? One of their TEACHERS! You got it! Their teacher at high school was driving them! She was encouraging this! Now, that makes me laugh! It was fun for them. They all wore self crafted "Halo" necklaces and were having too much fun. How can you say "no" to too much fun? If it were a student, a friend, a teenager driving, no way! But, somehow, the fun of it all, the group of kids together, the responsible chaperone, the saved money for this event, plus, the fact that it is the end of the quarter, well, it all added up to a final gift of permission from Mother. Thus, I didn't sleep well last night, and today is a fishing day for Jennie! Yesterday, I quit physical therapy on the recommendation of my doctor. He thought I should wait until I see a neuro surgeon, before I tried too much with my neck problem. He didn't want me to risk further injuring myself. I have extreme weakness in my left arm. So, by golly, I decided to fix that weakness! Hey! I can't fish well, so it needs fixing! I was out on the river casting. I stopped to move spots. I noticed I could barely hold my rod in my left hand to carry it. I was frustrated. This just wouldn't do. I stopped, picked up a large rock in one hand, and began vigorous exercises with it, in total frustration. I wanted to FIX it! I was mad at it for not working right! My frustration was also partly due to my conversation with my neuro's secretary. I called the neuro surgeon, and here's how the conversation went. I had put the call in, (three times!) last week, to Dr. Fixit. Dr. Fixit's nurse called, one week later. "Alright. We are backed up. How bout Jan 3rd?" "Yes, Jan 3rd. What kind of insurance do you have?" Medicare and Oregon Health Plan. "Oh, I'm so sorry... we don't take that, and no one else does either." So..... I thought I'd fix it myself! Lift those rocks! Make it burn, Jen! One! Two! Three! I lifted that rock! I sit now with an ice pack! I know there are currently many people reading ifish. Does anyone operate on necks? Hey, you can filet fish like a surgeon! I've seen it! Come on... It's just a little neck surgery! Line me up with those salmons and let's get to work! I don't know what to do. What on earth do people do when they are in a lot of pain, and no one can fix it? Lift rocks and go fishing! And although that sounds as silly as driving to Portland with your teacher to skip school, I'm going to go fishing!. And... I don't need permission from anyone!! I decided to take yesterday off of casting, and went into fishing mode. Click here, to see! It's not big, but it was fun! I caught it on the Wilson river, right after telling Bill that I should change baits, that my eggs were looking ragged. So, don't be thinking that some fish don't like ragged eggs. Some do! Today, I'm off to take Andrew to his eye doctor. Home tomorrow, then off to my eye doctor regarding surgery, on Friday. We'll see! Regardless, it's going to be a busy driving week! Couples today have a wide choice of birthing options that make the experience a personal, memorable, and as comfortable an experience, as possible. They can travel far, or stay near to home. Yesterday, as I walked the river from high to low, I spotted something that I hadn't expected. A birthing couple! I stood, fly rod in hand. Two feet from where I stood were two chum salmon, and one menacing relative that probably wasn't invited. I know he wasn't invited, as the couple kept chasing him off. I know people like that! The chum have never spawned in this particular location before. I was surprised, as it was so close to shore! Pulled to the attraction, I plopped myself down in the rocks, to watch. My fly rod was gently placed across my lap, and I tried not to move. It was the most intriguing "Discovery Show" that I had ever been a part of! The hen was mostly still, finning in the shallow current. The buck raced wildly around her, chasing off the other buck, and then joining the hen, almost side by side. With the rain falling on my bare head, I must have sat there for an hour. Kilchis sat by my side, not knowing what I was doing. After all, I hadn't been invited either, and my thoughts of feathers with hooks was just as menacing as the uninvited buck. This happens each year, yes. Not with such close encounters, but the presence of chum salmon in the Kilchis river. Remember, you can only target chum salmon until November 15th, and if I were you, I'd stay clear of the shallow riffles where they spawn, unless you are just there to watch. I pulled myself up and lost all interest in fishing. Instead, I was excited to know that I had something to look forward to, on my "health" walks to the river. Sometimes I begin to wonder... The Kilchis river offers me casting opportunities, and now educational viewing opportunities. I wonder if "fishing" is not much of an option. As I get ready to shower, and leave for fishing Tillamook bay, I'm yet more convinced. I catch most of my salmon elsewhere. On the bay, in the Wilson, in the Trask, on the Columbia. I view my salmon stamp and see that this is true. The Kilchis river is a magical, wonderful place. But, not usually a place to retrieve the salmon filets that grace my dinner table. 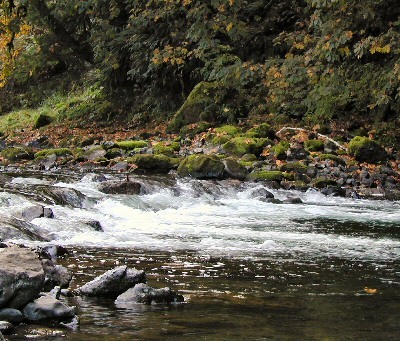 It's a place where I release hardy and spiritual cutthroat trout, practice my casting for other rivers, and have close encounters of the "salmon" kind. It's a place where I clear my thoughts, gain much from it's beautiful, rejuvenating and healing energy. It's a place that Kilchis my dog, and Molly my cat and I have wonderful times that build memories. It's where I live. I wouldn't trade it for anything. ... and you know, I won't stop casting. Casting brings me hope. And once the steelhead run starts, I really do get to fish! There were two things that came to mind the other day as I tried to replay the feeling I felt as I stood alongside the Kilchis River. What comes to mind is a split between the "Ho! Ho! Ho!" of Santa Claus, as he takes off from a rooftop delivering toys, and the total joy of our Heavenly Father on the Seventh Day, after he created the earth. "And God saw everything which he had made and it was very good." Those two things describe total joy, peace, and a seldom visited sort of all over satisfaction in life. I feel happy enough, quite often. But that "total joy" feeling washes over me only on rare, but memorable occasions. I felt pure joy! The kind of pure all over satisfaction in life that happens all too rarely! I had been on Tillamook bay in the morning, and it had been chilly. I had gotten fishing out of my system. That was a good thing. I didn't need to take a rod down to the Kilchis while I ran my dog, Kilchis. Molly the cat scampered behind us. I was wearing shoes that allowed me to walk more comfortably. No heavy hip boots, no cumbersome felts. No heavy neoprenes. I was light. My body moved freely. No rods tangled in the blackberry bushes. No difficult casts to plot. Just me and the river. I wore Bill's warm down jacket, and was pleasantly surprised to find hand warmers, still warm from that morning, in his pockets. The late Fall sun was shining down on me and gave the affect of warmth, although it really wasn't warm out. I suppose it was the down jacket and the hand warmers that made it feel like summer. I stared deep into the low and clear Kilchis river. I was warm. My hands were toasty! The down jacket was like a blanket around me! I couldn't detect any aches or pains in my entire body! I took a deep breath of pure, clear country air. I was feeling good, contented... but the "pure joy" thing didn't happen until I spotted a school of chum salmon, dancing in the swirling current. With the last slap of a tail, they vanished into the depth of the current, and that's when it happened. That's when the whole feeling of total peace and joy washed over me! Oh! If only I could feel that way more often! What a rush! Since then, every day I try to recapture that feeling. I still enjoy being down there, but can't seem to duplicate that whole body experience! Maybe it's the sunshine that's missing. Maybe I have too much on my mind. I just don't know. I just can't seem to gather all of the elements that achieved the pinnacle of happiness I felt that day on the river. You know what? I think it was meant to be that way. If we could reach that ultimate goal all of the time, it just wouldn't be a big deal, now would it? There is a chum salmon hen that lives in one spot in the river, a foot from shore. Every day I can go down to the river and expect her to be there. I have to creep up to the river's edge, until I see her. If I stand very still, she won't move from there, and just fins, swishing her tail in that one spot. I can stand and watch her in silence for quite some time before she realizes that she has company. Then, she swishes her tail faster, and moves swiftly across the gravel into a deep hole to sulk. I think she has spawned already, and is waiting to die. The white patches on her back show that her life is nearing the end. Upstream, I found a huge dead salmon floating in the shallows. I nudged it towards the current to take it downstream so Kilchis wouldn't roll in it. As the season progresses, I know this to be a waste of time. There will be so many, so soon! I never cease to be amazed by the powerful force that drives these salmon to their ultimate goal. To fight their way up the river to spawn, and then to die. I can't help but believe that after a salmon fights so hard to fulfill their goal, that after their deed is done, they must feel that ultimate satisfaction, joy and happiness that I felt, that day on the river. "And the salmon saw everything which he had made and it was very good." Perhaps very much like the hen that rests a foot from shore, on the Kilchis river. It was refreshing to me. In this season that so often marks a slaughter of blood, that has the capability to grow a bitter competition between so many anglers. To be able to see beyond that, to the salmon who have made it through miles of dangerous ocean, nets and predators, dodged those hooks, fought through high water conditions or low, and have made it to the journey's end. Now that's reason for pure joy. I feel really lucky, I suppose, to have felt that special feeling without having performed nearly such a miraculous thing as that. I don't know what I like better about fishing with Chris Sessions. Spending the day laughing, or spending the day catching fish! I think both! Chris is a master for hooking those sneaky chrome chinook, and if I know the night before that I'm going to be fishing with him, I can't sleep! He spent the night here the other night, and I knew that I was fishing with him in the morning. Therefore, I couldn't sleep a wink. So, at 4 in the morning, I got up and thought I had snuck quietly enough through the living room where he slept. He had left part of the TV on, so that the TV glowed in the dark. I quietly picked up the remote and turned it off. "HEY! I was watching that!!!" I nearly crashed into the coffee table, laughing. I don't think I stopped laughing until I thanked him at the ramp after fishing. Even then I giggled to myself, all the way home. I spent the day learning about new hooks, new techniques, new ways of doing things, and most importantly, playing lots of fish! I have got to wonder whether Chris has some kind of "secret sense" about where fish are. Had I been in the boat alone, I would have passed over water that he proved to hold fish. He'd stop at a place, and I'd look at him, half puzzled. "What are we doing here?" I'd ask, as he dropped anchor. It wasn't two minutes before he was wrestling with a fish on his line! I couldn't believe it! It's vital with guiding these days to have a close network of professionals who are into fish. Chris has that. He's in tune and in the loop to know where, when, and how. Chris spends his summers traveling and guiding in Alaska, and pretty much follows the fish, year round. He's one of those guys that was born with "fish on the brain!" He's a dreamer, and nothing will stop him from chasing the fish of his dreams. He's turned those dreams into reality, every time I have fished with him. It seems like if there are salmon in one of the fifty states in the USA, he owns a license to guide it. Call him on the phone sometime, and see! It's 1-503-706-6970. Sometimes I just call him up for the heck of it when I'm feeling blue or fishless. I'm certain to get a dose of fishing adventure at the other end of the line. Sometimes, even the experience of him landing a fish, via cell phone! That always makes me hang up with a giggle. I feel extremely lucky to fish with Chris, as his schedule gets busier and busier. It doesn't happen as often as it used to, so each time is a treasure. Thanks, Chris, and until next time, "Fish on!" You can book a trip with Chris by going to his web site, here. He's fishing in Washington and Oregon in the next few months. You won't regret it! Yawn. Fell asleep last night reading Linda Greenlaw's book, "Lobster Chronicles" and woke this morning to the sound of 35 mph gales... zzzz. I didn't feel too well yesterday, and Kilchis was very agitated with me staying in the house all day. So, I headed outside, blanket wrapped around me, to take pictures of the chums spawning. I got really close laying on the rocks a foot from where they spawn. I was down and motionless, and they started to get within range. Everything was going well. My shutter perfect, my flash off-- and all of the sudden, Molly the river cat jumped on my shoulders. Bye bye chum! Argh! I want to talk this morning about faith. It's miraculous, and it never ceases to amaze me. I'm a critic sometimes. A cynic, too. Even though God has come through for me time after time (after time! ), I doubt. I'm in a bit of a mess. I can't seem to figure out how to keep my medical insurance, and try to keep ifish at the same time. Medical insurance for me is way expensive. It's high risk, as if I were going to die tomorrow, they think. Watch me fool them! But, the situation remains that I am difficult to insure. That's been on my mind a lot lately. My worst nightmare in the world is growing old and alone, totally losing my eyesight and ending up having to live in some kind of public housing in Portland, so I'm close to medical help. It's a real possibility, but I try not to think about it. Anyhow, as the drama of my medical insurance unfolds, I have found myself having moments of less than faithfulness. In addition, the kids have expenses this high school year that are out of this world. I struggle to meet my bills. My car payment is late. Argh! Life! You know? However, I have been feeling a bit more calm and peaceful about everything the last couple of weeks. I've told you about my post office angel. She's just a darn nice lady, who reminds me often of our Heavenly Father's grace and love. She always has a smile on her face. Her laughter is a common melody, singing far outside the Post Office doors, turning smiles upside down through the abandoned winter streets of Bay City. Today, after I retrieved my mail, she asked, fully knowing of my struggles, how I was holding up. "A bit better, lately." I stated. "I still have no idea what I would do should I lose my insurance, but you know what? God does, so I will rest in that. He has never failed me." With that, I smiled, and left. I sat in the car with Kilchis, and opened the first envelope. It was very heavy, and I was curious as to it's contents. I opened the card, decorated with colorful salmon, and several twenty dollar bills spilled out in my lap! I settled back, shaking, to read the note. The letter praised me for my writing, and sharing my experiences with people. It spoke of how my writings had touched her. Shaking, I took the letter, and ran back to the Post Office Angel's desk. "Talk about faith! Talk about answer to prayer!" I was trembling, feeling a bolt of the most powerful presence of spirit that I had felt in a long time! With tears in my eyes, I shared with her the letter, and the monetary gift. It wasn't all for ifish or for me, and that made it all the more meaningful. On the drive home I thanked God for his faithfulness to me, and to others, and humbly apologized for my lack of faith, in the recent past. I have learned today that God is always with me. I have also been reminded to quit worrying so much about myself, and to look at the bigger picture. Indeed, God has a plan for me, and I should not worry! As long as I am in a position to help others, I will surely be alright! There are so many, many people so worse off then myself! This wonderful woman took the time to write me and has blessed me so much with her kind words of praise and gift of pizza for the kids! This has taught me the power and strength of written words, and how much of a difference we can make in other people's lives. She has more importantly blessed the kids that are forced to be in the hospital at Christmas time, and also blessed the wife of a wonderful man, Steve Koler. So many people will miss Steve, for the rest of their lives. When I think of these people and their situations, I am truly humbled. Hey... I just wanted to thank Sea Sparrow. Not only for her generosity of spirit, but for the lessons she has brought to my life, today. The weather was delightful as we unloaded the drift boat for what was sure to be a successful day of salmon fishing. Bill and I were dressed warmly. Almost uncomfortably warmly, both for rain, and cold. We walked to the boat, arms outstretched due to bulk, feeling like snow men. I was excited, knowing that all conditions were perfect. It's late in November for salmon, but this year's run seems to be late, so we were both confident. We floated down to our first favorite slot on the Nehalem and fished. We fished this way, and that, and that way and this, with no results. Gave up on hole one. Moved to hole two, which was really our very favorite. Just as we pulled in, a truck came racing down the hill, parked, ran out to "our" spot, and furiously began casting. Gave up on hole two. Oh well, hole three is really our most productive. Ran on down to hole three. Lined up perfectly with the rock that we had lined up with last time, and began to fish. Bill backbounced eggs. I floated a bobber. Bill floated a bobber, and I backbounced. My arm was getting tired. I know! A wrapped Kwik! I slid it into the rod holder, and it furiously worked in the most perfect current, as I rested. "Come on! Bend, rod, bend!" The fishless silence in the boat was thick. A black cloud floated over us in the sky. The water became dark, twisted and angry and before long, we were pelted with heavy hail and blown off anchor by an abrupt wind. 'That's OK. Let's move under that tree. I've seen people catch fish there, before!" We moved. We fished. We failed. "Let's fish that riffle we usually pass up." Bill said. We were nearing the end of the drift. Before long we were nearly in tide water, and we tried a deep, slow hole with a bobber, 15 feet down. You know, there are days that I get frustrated fishing, but for some reason, this wasn't one of them. Even though the fish weren't snapping, I was so thankful for the peace and quiet. Relief from pain comes in many forms. Many pain medications work by blocking receptors in the brain. These drugs alter the mind's perception of painful stimuli. It makes sense to me that fishing, or doing anything you really enjoy has a powerful affect on pain. Bill is often confused and amazed that when I am feeling really sick, I sometimes still go fishing with him. I do! Mostly because he takes care of all the hard stuff, and I'm just left to take my fishing medicine, and get better! When finally at home, Kilchis and I went out to the Kilchis river and watched the chum salmon. It's so fun to have a salmon aquarium in your back yard! With the water low and clear, they can't really hide. I watch them flash on their sides to dig the redds. I counted over 30 chums, working the stretch of river. A couple chum salmon floated down the river, nearly spent from their activity of keeping their species alive. They finned, ever so weakly, trying to keep up with the current. It was a losing battle, and they were washed over the riffles, and down, down, down to sea. With that, I began to feel about the same. The pain numbing effect of fishing was wearing off. I needed ice for my neck, and rest. I finally found a neck doctor that will work on my spinal problem! I need to wait until December 3rd, but I think I can do that! I just need to keep fishing, to keep the pain under control. That's not a bad prescription, is it? Also, I found an eye doctor that I really, really like. His name is Dr. Mathers at the Casey Eye Clinic. We had a great talk last visit. We talked about how doctors, (and especially famous and successful ones) play "hero" on a daily basis. That's how they feel good about their day to day work. I am usually difficult, so they put me with those "famous" doctors. Patient one walks in at 8:00 AM, and the doctor fixes him. So far, the day is going well! Patient two walks in and he fixes her, too. "It's a perfect day in the office!" Then, patient three, (me!) walks in with difficult problems that are difficult to fix. The Doctor cannot fix me, and instead may have made it worse. The doctor's day is not going so well, now. He said that can tend to make both the patient and the doctor have a bad day. He explained that that is why I may have less than pleasing experiences with doctors. He told me he was going to approach me with both of us knowing that my eyes are difficult. He said that if he feels he can fix my eye problem, after thinking about it long and hard, we will precede. However, we both need to understand and realize that the chances are there, that it won't work. So, I may be having eye surgery, soon. I can't wait to hear, and it's refreshing to know that he won't dislike me, or throw up his hands and give up on me if it doesn't work. So many doctors have done that to me in the past. I think he's going to stick it out! You know, if it doesn't work, and he ends up being upset after all, I'm going to take him fishing. I'm beginning to think that fishing is a cure all for almost any ailment. From pain to disappointment, it works for me! Sometimes it's fun just to hop in someone else's boat that is coming to fish the bay. Yesterday, I did just that, with Pete Morris. No hooking up the boat, no launching, it's pure luxury! Just hop in and go! As I sat in Pete's boat, with nothing to be responsible for except for my own rod and reel, I leaned over and stared into the salty water of Tillamook Bay. It became the salty water off of Newfoundland, and then Isle Au Haut, slapping at the chine. You know, I hesitate to read books, sometimes. I have a tendency to get totally lost in them. I just kind of "check out" for the duration, and then some. I have just finished all three of Linda Greenlaw's books. Linda is perhaps the only female swordfish boat captain in the world. She held a part in the famous story, "The Perfect Storm." Linda has skippered boats from Newfoundland to Brazil and has enjoyed a number of fisheries including harpooning and longlining for sword, dragging for squid, tub-trawling for halibut, and trapping lobster and crab. Her first book was "The Hungry Ocean", which I devoured with a hearty appetite. Presently, Linda works her own boat inshore, lobstering the water surrounding her home on Isle Au Haut, a small island off the coast of Maine. Thus the book, "The Lobster Chronicles." In between, there was "All Fishermen are liars." I raced through all of these books at warp speed. I became part of each one. Although I didn't read them in the order they were written, I was able to place myself in the appropriate time. I finished "The Lobster Chronicles" last, and I have got to tell you, each morning that I wake, I think I'm in Isle Au Haut. When I realize that I am not, a kind of depression sinks over me. Don't get me wrong. I love it here on the Kilchis River. But, I really escaped into these books. I couldn't wait, each night after dinner to make my way upstairs and open the covers of these books. In, "The Hungry Ocean" I was at sea for many, many days, and I came to love the characters in the book. In, "All Fishermen are Liars" I knew the smells of the bar that the interview took place in, all too well. It was warm there, and comfortable. The stories told became my stories. I don't consider myself an avid reader. After these books, perhaps I'll need to reconsider that opinion. Come to think of it, the same thing happened to me, reading Francis Caldwell's books. I felt like an addict, and when I closed the last page of the last book, I felt totally lost. I had spent a week or more in different places and time, and it took many hours to readjust to life on the Kilchis river. I walked around in a daze. Dinner was late, the kids had to call on me more than once, as I didn't recognize the term, "Mom." MOM? I'm a swordfishing captain, and I have no children! I just finished your last book, and now I have no life. Please write another. Back to life on the Kilchis river... I have an aquarium filled with spawning chum salmon out back. I sit on a grassy knoll, and try not to move my arms, so as not to spook them. I watch, as they come and go. They flip on their sides and flash silver at me as they dig their redds. It's fascinating, and I can sit there for quite some time, before realizing that dinner needs to be cooked, or the kids taken to town. Often, I faintly hear the old dinner bell on the back porch, calling me to my duties as head housekeeper, Mother, and cook. It shakes me awake, as I begrudgingly get up to leave them. It seems in all, that I am enjoying an escape from life, lately. Whether it be from running from the publicity of a news article, or from the day to day grind of being Mother on ifish, or Mother at home. Give me a book, a dream, a chum salmon to focus on... I'm just "out of the office..." "Gone fishin'..."
But, I'll be back soon. That is, until Linda Greenlaw writes me another book. Ifish is getting too big for our britches! This morning, we are trying something new. Switching to InnoDB so that the searches on ifish don't put so much pressure on ifish. I think it will only be a couple of minutes, but I just don't know, for sure. Expect delays and errors throughout the morning, while we attempt to fine tune it. Yesterday I hopped in the boat with Bill and headed out to the bay for a bit. I've got a big jinx going. I can't hook a salmon for my life! I think it is a protective thing so that my shoulder will get better, faster. It's got to be something like that! :) I'll not give in, nor give up. I tried reverse psychology on them, yesterday. I shouted down into the water, "Stay away from my bait, you pesky salmons!" I thought sure that would do it! Salmon have a mind of their own and surely couldn't pass up being naughty. Nope. The boat next to me got one. Salmon mind what you say! Proof positive! They stayed away from mine, and took his! Sheesh! I can't win! So, then I yelled over to another boat that was catching, "What color of lipstick are you wearing?" He told me yellow. Alright... Fine! What girl in their right mind would wear yellow lipstick? I searched through my purse, but I just knew I didn't have yellow! Oh no! If only I had yellow lipstick, I, too could be catching salmon! With yellow-less lips, and the command to stay away from my bait already ordered, I just knew I was sunk for the day! In all seriousness, the bite wasn't bad at the Ghost Hole yesterday. Rumor has it the day before, even better. You know, one of those, "Should have been here yesterday!" That always happens to me! Today, it's off to Fred Meyers for some yellow lipstick. I will not command my salmon to stay away from my bait. I'm getting this down... this salmon fishing thing. So much to be thankful for! Count the ways! ..and thank YOU, for making ifish a tremendous success that never ceases to amaze me. Ifish is truly a gift that happened by surprise. I can't tell you the friends I've made, how it has enriched my fishing life, and touched my heart! Oh! And there is a great boat for sale, here! It's CHEAP! Thanksgiving is always so nice. I rose in the morning, and very relaxed, put together the pre dinner snacks that I was responsible for. I lounged in my pajamas, built a fire, and even had time to make sure the presentation on the food was gorgeous! Little grape tomatoes in bunches, and dill, scattered around a filet of smoked salmon. Succulent shrimp tails on a shiny sterling silver tray. I'm ready! Christmas is a lot of work. Plain and simple, it isn't what it is supposed to be. I love Christmas! I do! I even feel that "spirit" already! I nearly stopped at Fred Meyers this morning to pick up one of those fake garlands of greens to decorate my bird feeder stand. I always wind it in that, and then tie tiny red bows around up and down it. It's so cute, and the birds love the hiding places. But then-- I thought of the post Thanksgiving holiday shoppers. The lot was as full as the Wilson river on Christmas week! There was no way! From now on, I will plan my Fred Meyer shopping for earlier than eight in the morning. Oh, the work, the worry, the hurry the scurry! The spending, (or the lack of spending! ), the presents to wrap, and people not to forget, the lines, the people, the parking! Since when did the Bible state, "Jesus Christ is Born! PANIC EVERYONE! ??? It doesn't, does it? How absolutely weird, to have Christmas turn into something I half dread! After I prepared my food for the feast, we drove to Lake Oswego, where all of my extended family gathered. It was so nice to see my Dad! He looks great! We laughed! We hugged! I love catching up my nieces and nephews, and at the same time can't believe how big they are! How old! But, it was relaxing and really, really nice! My Dad, of course, made me play the piano, which was terribly embarrassing. I just wasn't very good! Remind me please, to at least try to keep up my chops? I haven't played in months! I got to hear my niece play and man, is she good! It's really nice to know that someone is holding the torch, there, and will carry on the family's musical heritage. The only bad thing about Thanksgiving away, is that we have no leftovers. So, yesterday I prepared a turkey with all of the trimmings, and of course, pumpkin pie. All week, the boat snacks will include turkey and cranberry sandwiches. Oh! How they go with winter steelhead fishing! The Kilchis yesterday was absolutely perfect. The barometer was rising, the river was falling, and held a deep green opaque color. Perfect level, perfect fishing. Well, that's what me and several thousand others thought! I couldn't believe the amount of boats going down the river. Aluminum hatch! Bill backed the trailer down the gravel bank, and we launched out back. Luckily, we were able to get our spot. Bill lost one right off, but curiously, that was the only fish we hooked into! Boats passing by had either shrugs or negative head shakes to offer. I don't know this, but I would assume it just wasn't all that hot, yesterday. I don't know why. It sure looked fishy! I feel an apprehension as the river rapidly falls, and as Christmas approaches. What's more important? Shopping for Christmas, or catching a fish? Argh. I will never get my shopping done! Here, fishy, fishy! So, it's early! But, with frost on the ground all day long, I couldn't resist taking out my boxed Christmas things, and decking the halls with but a few red ribbons of festivity. As I look out onto the frosty meadow, I think I'll play some of my favorite Christmas music. Yesterday, I had the kids neatly pack away our Thanksgiving decor. All of the fall leaves that were in baskets, all of the pilgrim candles and indian corn are are boxed away until the next return of fall chinook. With just a few bells and ribbons, and one garland of greens, I'm satisfied. Funny, how I get this stuff out, and it's so fun and new! By the New Year I can't wait to rid the house of any sign of it! The river sets the seasons for me. I have lived here on the river for four full years of seasons now, and have so intimately participated in the activity. I feel more in tune to the goings on of the river, than of the leaves on the trees, or the life in my garden, or the temperature of the air around me. Of course, it's all cumulative, but the river has become most a part of me. The cutthroat come. The cutthroat go. The steelhead dance in, celebrating Christmas, and just as I find pine needles in the carpet, long after Christmas, I find a stray native in the river, long after the hatchery run. The salmon... Oh the salmon! The salmon have set Fall as my very favorite season. They are so easily visible in all that they do, from a huge splash in the current when they are chrome bright and feisty, to the death roll they attempt, as their lives end, in the stillness of the back eddies. I sit and watch for hours, as they dig their redds, flashing their chrome bright sides like a flash from a camera. The fanciful colors of chum salmon are in direct harmony with the brightly colored leaves of early Fall. The river levels rise and the salmon disappear, only to reappear as the river again lows. These same salmon seem to age with an amazing speed. Just as the trees leaves sog and turn to earth, the salmon follow suit. Their flesh turns white with the rise of water; their energy sapped by the increase in current. Some are dead, laying in the shallows, some are barely finning, slowly over their nest. Early December seems to always bring low water levels. Frost sticks on the ground, and long days without a shadow, grace the canyon. A sparse new salmon enters the stream, just as the last leaves of the trees fall in a biting December wind. Soon... soon it will be Christmas. A high water will come, sometime mid December, and with it, wash away any signs of salmon. Out to sea, they flush! I want Bill to row me to the other side, so that I can hang one silver ornament on the tall tree that shadows the deepest hole. A welcome ornament, for our holiday guests. Steelhead, dancing and jumping in total celebration!! The world prepares for the celebration of the birth of Jesus Christ in such timely fashion! There is something about steelhead entering the river, that is so much more joyful than salmon. Salmon come to die. Steelhead come to return! It's like they are born again! People of all over rise to the occasion and toss brightly Holiday colored corkies and spinners, and plugs! I'll not forget my many icy cold fingered days, drifting the river right before Christmas. At times, I have dressed for the occasion. Once, even wearing reindeer horns! What fun! The Christmas season packs the river ramp lots with Holiday crowds. If you don't catch a fish on the river, you'll be sure to catch a smile! So many people gathered, doing their favorite things! And this, my friends is what we have to look forward to! I for one, am ready!